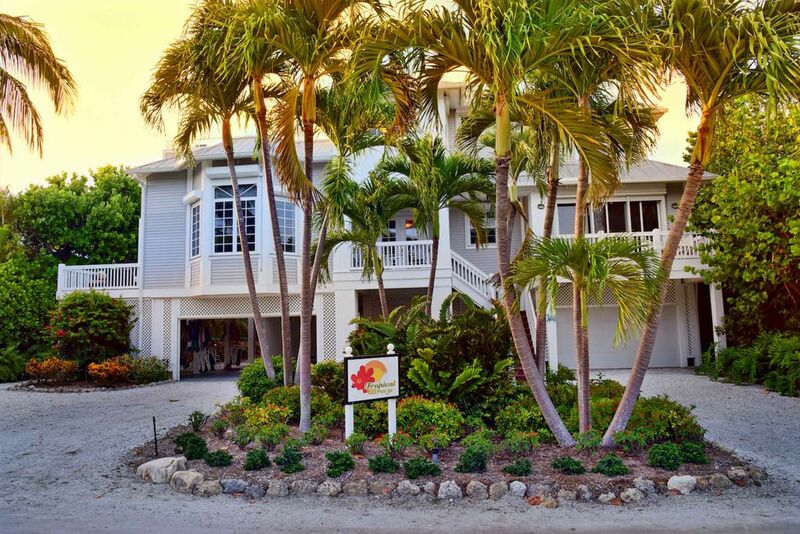 Tropical Breeze was built in 2000 a luxury vacation rental home located on Wightman Lane in Captiva Village on beautiful Captiva Island. Fully landscaped and mood lighted in the evenings so the fun can continue with private heated enclosed pool, Bar BQ, pool table, table tennis, foosball table, Tiki Bar with TV. Dinner seating for 12, even a bathroom. Fun time for families and friends, why stop when the sun goes down. It is positioned on a quiet and tropical sandy lane covered by palm trees and Royal Poinciana. Far enough from the center of Captiva village for peace and quiet but close enough to be able to walk to and enjoy all the amenities. This beautiful luxury vacation rental home Tropical Breeze is just sixty yards away from one of the best beaches in the world in Captiva Island Florida. It is available for holiday vacation rental and has five bedrooms with en-suite bathrooms. It has 4200 square feet of air conditioned living space. The first floor has a master bedroom with a King sized bed and bathroom and a twin bedroom with bathroom. The second floor has another master bedroom with a King sized bed and bathroom as well as a King bed with bathroom and a twin bed room with bathroom. The home is fully tiled, bright, light and spotlessly clean. Activities: One of the best beaches in the world, Biking, Golf, Fishing both Game and beach, Wildlife Viewing, Shopping, Restaurants, Sightseeing, Swimming, Snorkeling/Diving, Boating, Sailing, Windsurfing, Parasailing, Jet Skiing, Shelling, Music, Walking, Cinema, Theatre, Tennis, Canoe & Kayak Tours, Cruises to other islands, Dolphin & Shelling Trips, Captiva's Chapel By the Sea. Shopping: Captiva has a wonderful array of shopping facilities, with many shops selling locally designed and produced items so you can leave your holiday with a reminder of many wonderful memories. There is a well-stocked grocery stores near the house as well as shops selling a huge variety of goods. Area: Captiva Island is a barrier island connected at the far end of Sanibel by a bridge. Captiva is one of the most exclusive islands in North America and is one of the worlds finest holiday locations. Captiva is located on Florida’s fantastic Southwest Gulf coast just 3 ½ hours drive from Miami and 4 hours from Orlando. Southwest Florida’s International Airport at Fort Myers is 50 minutes drive away. We had been visiting Captiva for years and fallen in love with it, the next step was to buy the home of our dreams, our family and friends have loved vacationing at Tropical Breeze. Once we saw the house we knew it was the perfect home for our family. A perfect venue for familys of all ages. Just 3 homes from one of the best family safe beaches in the world. Simply one of the finest homes on Captiva, it provides everything you could require for your stay in paradise. Tropical Breeze is privately managed. We we were frustrated with our experience with rental agencies, they never provided the service we required for our guests, everything provided was cheap and of the lowest quality, and the house was dirty because their cleaners didn’t care. Spend 1,000’s dollars to rent a home and have a few mini soap bars, 3 dishwasher tablets and thin poorly laundered bed sheets. As the caretaker and host at Tropical Breeze for owners Phil & Natalie Buckingham, my wife, Bonnie and I will personally handle your reservation, make sure the home is generously supplied with bath soap, laundry detergent, dryer anti-static sheets, dishwasher detergent, dish soap, paper towels, toilet paper, salt & pepper, pre-measured coffee packs, sweetener, and ice… all the things you often need to waste time purchasing when renting though a rental agency. Lee will meet you at our home on arrival. He can organise rentals of cribs, bikes, kayaks, golf buggy’s, organise trips or activities for you if you wish, and can also facilitate the stocking of food and drinks etc before you arrive and makes sure the house is in perfect condition for you. We are proud of the fact the house is always spotlessly clean. There is a reason why Tropical Breeze has consistently received the reviews it has, we love our home, and so do Lee and Bonnie and we want you to have the best possible vacation. toilet, shower, By pool so much more convenient, no need to go into house. All bedrooms have full en-suite bathrooms (Jacuzzi tubs and walk in showers in the master suites) and spacious closets. Pool bathroom toilet and shower. Outdoor shower for when back from the beach. The home is only sixty meters from the entrance to the beach. No roads to cross so so safe for children, the beach is so close you can easily pop back to the house if you need anything. Far enough from the centre of the village for peace and quiet but close enough to be able to walk to and enjoy all the amenities. The home is only sixty meters from the entrance to the beach. It has 4,200 square feet of air conditioned living space, and has Gulf views from the upper deck and upstairs master bedroom. The house has a 60mb Comcast cable connection that is linked to a WiFi router. The house has a 60mb Comcast cable connection that is linked to a Linksys WiFi router. (4) Large ice making fridge in kitchen, 2 additional fridges on ground floor for drinks and ice for pool and beach. Fridge top floor for Sunset view drinks. Everything a serious cook could require. With a fully equipped kitchen and dinning area it has everything for those that want to entertain at home. (7) The living room and all the bedrooms have internet TV so you can access online service like Netflix. The Tiki bar also has a tv for those games you cannot miss. Large library available, with a computer. The games room is around the pool. It has a ping pong table, full size pool table and a foosball table. The house has a distributed sound system linked back to a FM tuner and to a ipod connector in the living room. Full size table by the Tiki bar and pool. Beach toys provided for kids of all ages. On beach Jet skis and boat and boat hire. The wonderful heated pool and the upper and lower decks sit in a fully screened area with lush tropical vegetation, a perfect place to enjoy your swim and Bar-B-Q after a busy day on the beach. Captiva Island is unlike any other holiday destination in Florida, it has the feel of a tropical island. It is only 5 miles long and up to ½ mile wide, it is unique and unlike any other area in the USA. Over 80% of the Islands’ (Sanibel & Captiva) are a nature reserve, including the world renowned J.N Ding Darling National Wildlife Refuge. There are no traffic lights, bill boards or street lights. No building is allowed to be higher than the tallest trees. The speed limit on the island range from 15 to 35mph, a single lane road runs the length of the island. Captiva has a tropical year round warm climate and lush tropical vegetation, wild life is in abundance with Ospreys, Eagles, Pelicans and numerous sea birds, as well as Dolphins and Manatees. Tropical Breeze is located just 2 houses from the beach in Wightman Lane which is in Captiva Village. Captiva’s beaches have been voted in the top 5 in the USA. Actually, my rating for this vacation house is 5+ stars. This was our first time renting a house in Captiva Island and we selected the perfect family vacation house. There were plenty of amenities in the house and the house is in excellent condition. Lee and Bonnie went out of there way from the time we arrived until our departure. If we had any questions or issues with the house during our week, Lee responded / resolved immediately. The beach was an easy walk of 50-60 yards, which makes it easy for getting to & from the beach several times with kids. The house is equipped with various beach items (chairs, towels, umbrella, toys, cart for carrying beach items). The lower house level with the heated pool, tiki bar, ping pong table, etc., was a great entertainment area for the family. I would recommend this vacation house to anyone looking for a great family vacation. Captiva is a great destination and this house is the ultimate playcation! My wife and I, along with our three children, spouses, friends and two infants (11 total), enjoyed the wide-open floor plan (great-room/kitchen-dining) with room for everybody, as well as the privacy of each having our own master bedroom suits (walk-in closets double-dutied as nurseries). The exterior lanai-pool area is great for chilling while the kids nap and is party-central when they're down for the night. Complete with pool table, ping-pong table, fooseball and Tiki-bar with hide-away flat screen, we happened to luck out and watched our Red Sox win the world series, as well as Monday night football Pats vs Bills, both of which were indeed all the more special in this playful venue. The beach is really just steps away, and sailboat, jet-ski, and umbrella rentals are right there, just like being at a resort. Seeing the nearby islands by boat is a fun day activity. We rented one for the day (reasonable rates) and enjoyed island hops along with food and drink stops at Barnacles (great conch fritters) and the beautiful Cabbage Key which features great dining and endangered Gopher-turtles. Property managers Lee and Bonnie Bordengorfer offer quick response and care. We had a dishwasher issue and they had an appliance tech quickly there to fix. The house is clean, the kitchen is complete with utensils etc. for any kind of cooking, there are plenty of towels, both bath and beach, two laundries, beach chairs, sand toys, cooler- the total package; just pay and play! Tropical Breeze is so luxurious and yet so comfortable and fun! We celebrated our 50th Anniversay with our two children and their families and it had something for everyone! The kitchen is very well stocked for both dining and poolside meals. And while the kids are in the pool, playing ping pong or fooseball....the adults can enjoy happy hour at the Tiki Bar or enjoy quiet time on the 4 beautiful decks. I certainly recommend Tropical Breeze for a very memorable vacation. We experienced some lighting issues after a lightening storm and managers Bonnie and Lee were easily accessible and remedied the situation immediately! Thank you, Diane & Reggie, for choosing Tropical Breeze and for your kind words. Glad to see you arrived home safely. Hope to see you again soon. This five bedroom and six bathroom home is a beautiful property very close to the beach on a private road. Each year we come back to this home is gets better and better with upgrades and additional amenities. The full bathroom and tiki bar with drop-down TV by the pool were the most recent awesome upgrades. The breakfast and family room area have been recently remodeled. The farmhouse dining table that seats 10-12 people is wonderful for family dinners and playing games. Appliances are regularly upgraded, and now they have a high efficiency washers and dryers on the first floor and second floor. There are many good restaurants nearby. The Green Flash is our favorite! The caretakers, Lee and Bonnie, do their best to make you comfortable and are always available if needed. We look forward to returning to this beautiful property soon! Perfect Home for a Family Holiday! Our family has vacationed on Captiva for many years, and Tropical Breeze was by far our best experience. It is the perfect home for a family vacation and enjoying what Captiva & Sanibel offer. The Buckinghams, Lee and Bonnie, obviously care greatly about the home and its presentation. They were extremely helpful during our booking and lead-in to our arrival. Lee and Bonnie helped with stocking of groceries for our arrival, and even had gifts for the wives and kids what a great surprise! Perfect location you can just rent a golf cart, Tropical Breeze has absolutely everything needed to enjoy the island plus it is a 30 second walk to the beach and very short stroll to the Mucky Duck. Hard to describe all that the home offers…perfectly supplied/appointed as other guests have written, and we all loved the game room and pool. Sunset view was fantastic! We’ll definitely return to Captiva, it will most certainly be at Tropical Breeze. Wonderful house with amazing access to the beach! We had an amazing time at Tropical Breeze and were really impressed with the beauty of the home, the ease of access to the beach, and the superb customer service provided by the owner (Phil and Natalie) and the manager (Lee). We were 6 adults and 3 kids (two three-year olds, and one seven-year old) in our party and we got great use out of the 5 bedrooms, pool area, common areas, and sun deck where we would watch the sunset in the evenings (one evening, we saw a beautiful double rainbow after a light t-storm). The description of the location, layout and amenities were accurate. The property was clean and well-maintained, and had everything you could need including pool toys, beach toys for kids, chairs and umbrellas that you could take to the beach, and even a wheelbarrow for transporting it all. The beach is only 1 minute walk away and is just breathtaking. The owners and managers provided great customer service, everything from e-mails answering my additional questions about the property, showing us around when we arrived, giving us recommendations for a photographer to come take family portraits on the beach, and even sent us back the DVDs that we forgot in the house! We were just so happy with their graciousness and friendliness. It made our stay so much more comfortable, and we really felt relaxed in their home. I would definitely recommend this property to a friend or relative (just don't go when we want to go back ;-)!! While we were there, we enjoyed going to the Shell Museum and the Ding Darling Wildlife Refuge. As for restaurants, we enjoyed the Bubble Room (real hit with the kids! ), the Mucky Duck (right on the beach and perfect for lunch), RC Otters (casual restaurant, good for kids) and the Green Flash (good for adults). But the thing we enjoyed the most was going to the beach every day, seeing dolphins while swimming in the early evening (around 6pm), finding sand dollars and hermit crabs in the ocean with our feet, and using the pool to relax and play "Marco, Polo" with the kids! One factor that ensures that Captiva is exclusive and its beaches never busy is that you are not allowed to park cars on the roads on the island. Parking is only allowed at the few public car parks or in restaurant car parks. A short walk from the house is Captiva village which is a lovely mix of restaurants and shops. At Tropical Breeze you really can park the car and not use it for days on end. Captiva’s unique west facing position off the coast of Florida means that you have all the benefits of the glorious beach and the fun of the sea as well as incredible sunset views. A short walk away on the east coast is the Roosevelt Channel with its inland fishing and boating. Golf: Golf Digest ranked the Fort Meyers-Cape Coral area in the top twenty best metropolitan areas for golf in the USA. The closest course to the house is Redfish Point a nine hole course in the South Seas Plantation Resort located at the north tip of Captiva Island. There are two 18 holes courses a short distance away on Sanibel Island, the Beachview Golf Club and the Dunes Golf Club.